Many of the prophesies of the Old Testament were fulfilled in their time, but partially. When we read the Old Testament in light of the Gospel and knowledge of Jesus, we see the fulfillment in Jesus as the ultimate plan of the Father. In our first reading (Deuteronomy 18:15-20), Moses gives his farewell address to the Israelites on the banks of the Jordan before they cross over to the promised land. He instructs them to listen to the prophet the Lord will send them. In last week's Gospel, Jesus proclaimed, "This is the time of fulfillment, the Kingdom of God is at Hand". 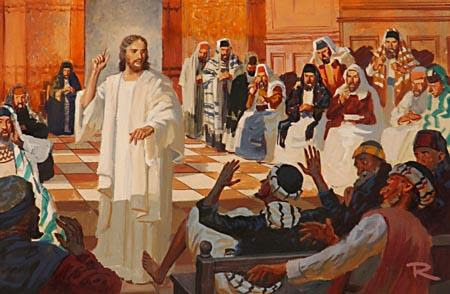 In the Sunday's Gospel reading (Mark 1:21-28), we see the an example of this fulfillment - Jesus' first day of public ministry. Jesus is the ultimate fulfillment of the prophesy of Moses we read about in our first reading. Then they came to Capernaum, and on the sabbath Jesus entered the synagogue and taught. The people were astonished at his teaching, for he taught them as one having authority and not as the scribes. In their synagogue was a man with an unclean spirit; he cried out, "What have you to do with us, Jesus of Nazareth? Have you come to destroy us? I know who you are-the Holy One of God!" Jesus rebuked him and said, "Quiet! Come out of him!" The unclean spirit convulsed him and with a loud cry came out of him. All were amazed and asked one another, "What is this? A new teaching with authority. He commands even the unclean spirits and they obey him." His fame spread everywhere throughout the whole region of Galilee. In our Epistle reading (1 Corinthians 7:32-35), St. Paul is instructing the disciples of Corinth about the married vs. the unmarried (or celibate) life. Both are good, but the unmarried is more free to serve the Lord completely. Jesus is the ultimate prophet. He teaches with authority in the synagogue and is the one whom even the demons obey. He is the one of whom Moses proclaimed that God would "raise up from your own kin" and will put "My words in his mouth". Listen to him! For additional insight, read Father Gonyo's commentary on Deuteronomy in this weeks "Pastor's Message"